The Royal Entomological Society was founded in 1833 and is one of the oldest such societies in the world. Its records are an invaluable source for historians of entomology and the natural sciences both in Great Britain and overseas. This guide is principally a catalogue of the records of the society from the time of its foundation, but also covers the records of some earlier societies and collections of papers by individual entomologists. 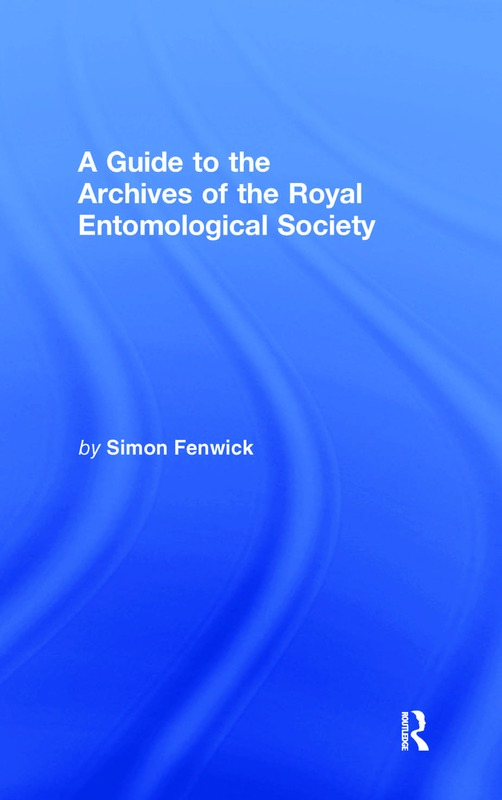 The book is introduced with essays by Brian Gardiner on the history of the Royal Entomological Society and on the development of British entomology, and by Simon Fenwick on the archives and their potential for historians. Contents: Foreword, Roger Blackman; A short account of the Royal Entomological Society and of the progress of entomology in Great Britain (1833-1999), Brian O. C. Gardiner; The archives of the Royal Entomological Society, Simon Fenwick; M1-M53: minute books; J1-J122: journals and miscellaneous volumes (non-Society); Boxes 1-12: correspondence of Alexander Henry Haliday (1807-70); Boxes 13-16: correspondence of Herbert Druce (1846-1913); Boxes 17-25: correspondence of Roland Trimen (1840-1916); Boxes 26-32: general correspondence; Boxes 33-36: editorial papers of Professor Edward Bagnall Poulton (1856-1939); Box 37: office files; Boxes 38-40: Roland Trimen papers (cont’d); Boxes 41-56: Society business and miscellaneous; Boxes 57-62: correspondence and papers of Hugh Warner Bedford (1894-1979); Boxes 63-75: correspondence and papers of Colbran Joseph Wainwright (1867-1949); Boxes 76-87: miscellaneous and society business; Boxes 88-89: papers of George Charles Champion (1851-1927); Boxes 90-111: Miscellaneous illustrations, unboxed illustrations and portfolios; Appendix I: establishment of the Entomological Society of London, Brian O. C. Gardiner; Appendix II: index to photographs held at the Royal Entomological Society Library; Appendix III: Index to the Royal Entomological Society’s archives.